Two upcoming International Space Station (ISS) spacewalks slated for January are expected to result in a crucial update of the orbital laboratory’s power generating system. Expedition 50 astronauts are scheduled to venture outside the ISS on Jan. 6 and 13 in order to replace the old nickel-hydrogen batteries with new lithium-ion batteries on the station’s truss structure. “The spacewalks will be an important upgrade to the station’s power generation system,” NASA Public Affairs Officer Dan Huot told SpaceFlight Insider. First spacewalk will be performed by NASA astronauts Shane Kimbrough and Peggy Whitson. One week later, Kimbrough will be joined by its ESA crewmate Thomas Pesquet during the second extravehicular activity (EVA) of the year. But before the astronauts will start their work outside the station, the new batteries will be robotically extracted from a pallet to replace 12 older nickel-hydrogen batteries through a series of robotic operations using the Canadarm2 robotic system. Three of the older batteries will stay on the station’s truss, disconnected from the power grid, while the remaining nine will be stowed in a cargo resupply craft for later disposal. “The spacewalkers will have the task of installing adapter plates and hooking up electrical connectors, something that they have done extensive training on in the Neutral Buoyancy Laboratory in Houston,” Hout said. It will be the first time these adapter plates have been installed, however batteries have been replaced during spacewalks in the past. NASA astronauts Chris Cassidy and Tom Marshburn replaced four nickel-hydrogen batteries back in 2009. The new batteries, known as Lithium-Ion battery Orbital Replacement Units (ORUs), were delivered to the station in December 2016 by the sixth Japanese H-II Transfer Vehicle (HTV-6). Once installed on the ISS, the new batteries will be charged with electricity generated by the solar panels and used when the station travels through shadow areas. Designed by Aerojet Rocketdyne the batteries weigh about 550 lbs. (250 kilograms) each and use cells manufactured by the Japanese company GS Yuasa Technology Ltd. One ORU hosts three banks of ten cells. 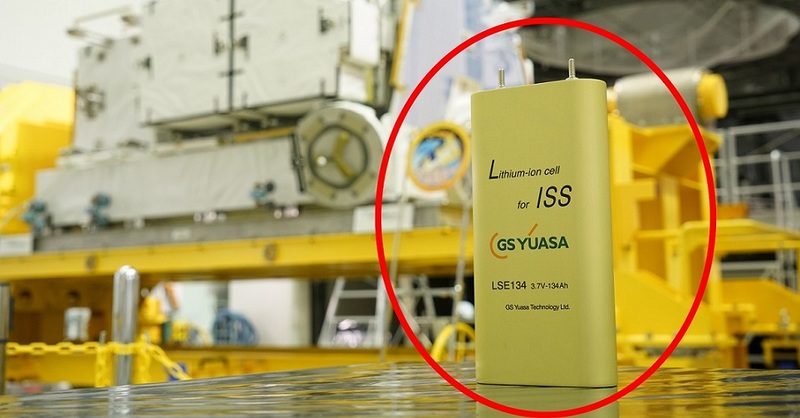 The batteries are designed to power the station for nearly 10 years. They have an end of life capacity of 48 Amp-hours for at least 60,000 charge-discharge cycles. Overall, 24 new batteries of this type will be installed on the ISS, the remaining ones are scheduled to be delivered by future HTV missions. "Efficient, reliable and safe electrical power systems are absolutely critical for the astronauts who live on the International Space Station. It's also important for the research they conduct to better understand life in space and here on Earth," said Aerojet Rocketdyne CEO and President Eileen Drake. "It's a privilege to know our lithium-ion batteries are helping to make that possible." Current 48 nickel metal-hydride batteries onboard the station that were made in the U.S., need to be replaced due to approaching end of their service life (approximately 6.5 years).